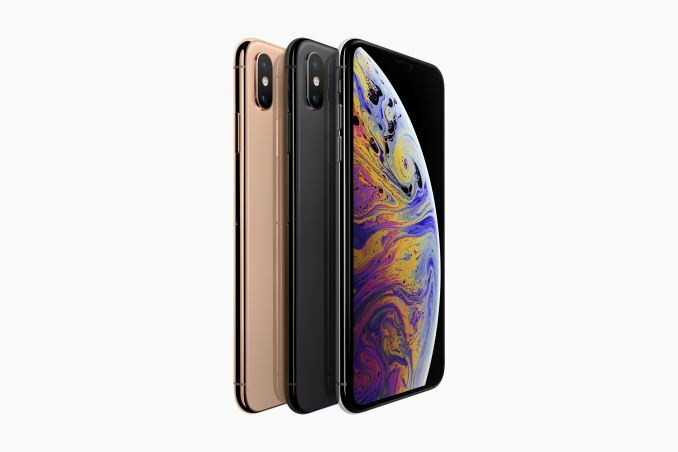 The core of the new family is the iPhone XS, which like Apple iPhones before it, has received a mid-generation “S" upgrade. Apple’s big focus this year is on photography, along with an ever-faster SoC at the heart of the phone. 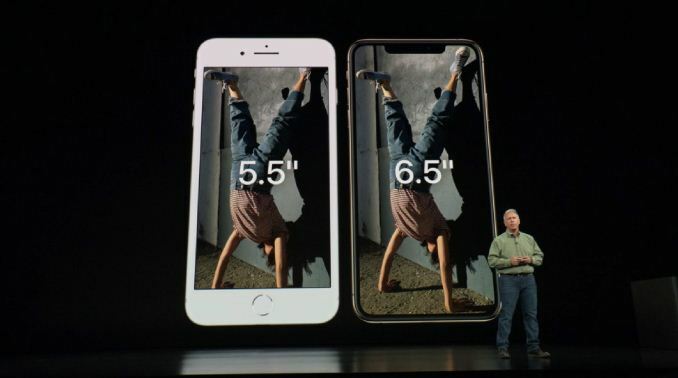 The iPhone XS is joined by the even larger iPhone XS Max, which offers the same features with a bigger screen and bigger battery. Meanwhile as a pseudo-replacement for the iPhone 8 family, the iPhone XR is a slightly pared down XS, incorporating many of the same features but dropping the telephoto camera and using an LCD display instead of OLED. 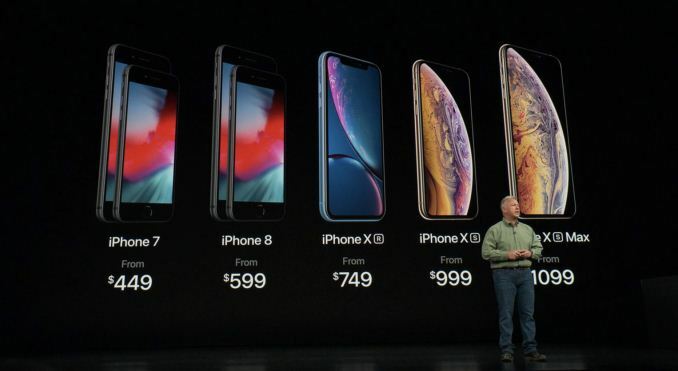 Battery Life (Internet) "12 hours" "13 hours" "15 hours"
Starting off with the core of the family and Apple’s new flagship phone lineup is the 5.8-inch iPhone XS and the 6.5-inch iPhone XS Max. 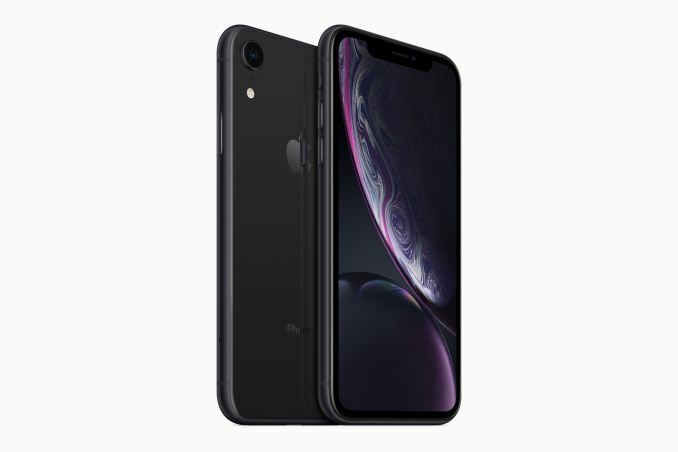 Analogous to the relationship between the previous-generation regular and Plus iPhone models, these two phones are the same platform offered in different sizes, with different screen sizes and batteries to match. However beyond that, the phones are identical in terms of feature sets. And that marks an important distinction between X/Max split and Apple’s last generation phones. The smaller phone has all the same features as the larger phone – or rather, the larger phone doesn’t get anything extra – so it’s unlike the last generation where Apple’s best camera system could only be found on the largest phone. The iPhone XS Max really is just a larger iPhone XS. The iPhone XS itself picks up where the iPhone X left off. This utilizes the same 5.8-inch body as its predecessor, with an OLED screen embedded within. Based on the specifications Apple has posted, it doesn’t look like the OLED panel on the XS is any different than on the X; we’re still looking at a 2436x1125 pixel display supporting the P3 color space and a max brightness of 625 nits. Instead Apple’s focus is elsewhere, on things such as the SoC, cameras, and better sound reproduction. The new screens now also support Dolby Vision HDR10 - taking advantage of a complete 10-bit camera to display pipeline. 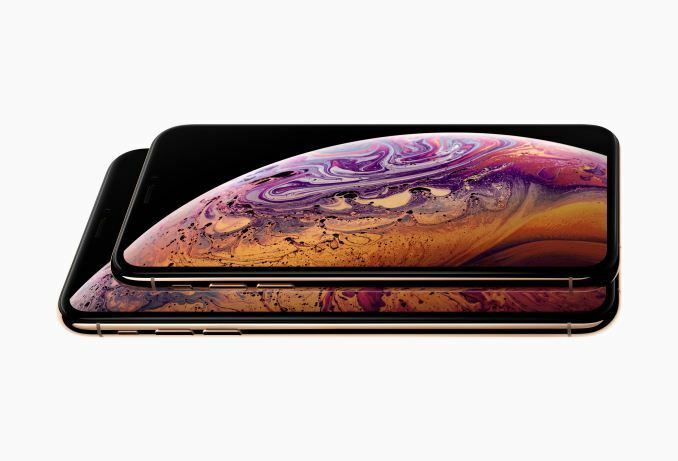 The iPhone XS Max, in turn, is all but a larger iPhone XS. With a screen size of 6.5-inches it’s from one perspective Apple’s largest iPhone yet. Though in terms of body size, it’s actually ever so slightly smaller than the iPhone 8 Plus by about 1%. In that extra space Apple has put a larger battery and a larger OLED display. In the case of the latter the XS Max gets a 2688x1242 pixel display, offering the same pixel density as the X/XS (458 PPI) with more pixels to cover the larger phone. Unfortunately Apple is no longer publishing their battery capacities, so while we’re told the Max can last 1.5 hours longer than the iPhone X, we don’t know how that translates into Watt-hours. Past that, what’s at the heart of both phones then is Apple’s latest generation SoC, the A12 Bionic. Details on this SoC are relatively sparse – Apple spent less time than usual focusing on the SoC – however the company was quick to point out that this will be the industry’s first 7nm SoC to ship. And Apple will be putting the latest process node to good use; the chip is comprised of 6.9 billion transistors, an increase of 60% over the 4.3B transistor A11 just a year ago. Under the hood of the A12 is a similar CPU configuration as last time, with two high-performance CPU cores joined with four low-power (efficiency) CPU cores. Apple’s performance estimates this time around are very conservative, as the company is touting just a 15% increase in the performance of said performance cores. Instead the focus is on power efficiency, with Apple claiming a 40% reduction in power on the performance cores and 50% on the low-power cores. Though as is usually the case here when discussing performance and power efficiency in the same breath, these results should be taken with a grain of salt, as you usually can’t simultaneously decrease total power consumption and increase total performance. Most likely these power figures are being measured at the A11's performance level. 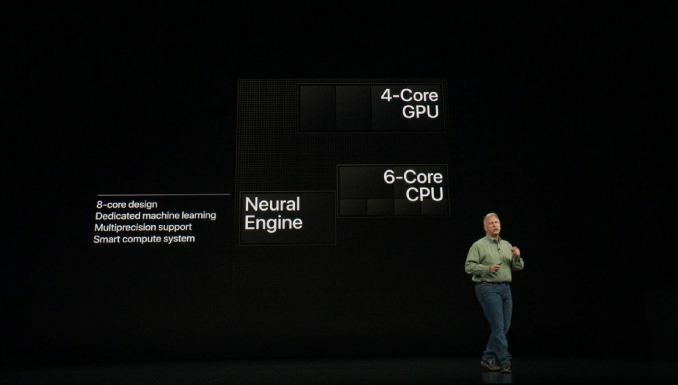 Paired with the six CPU cores is Apple’s latest GPU design. From a basic standpoint, this latest GPU is a 4 core design, up from 3 cores in the A11. 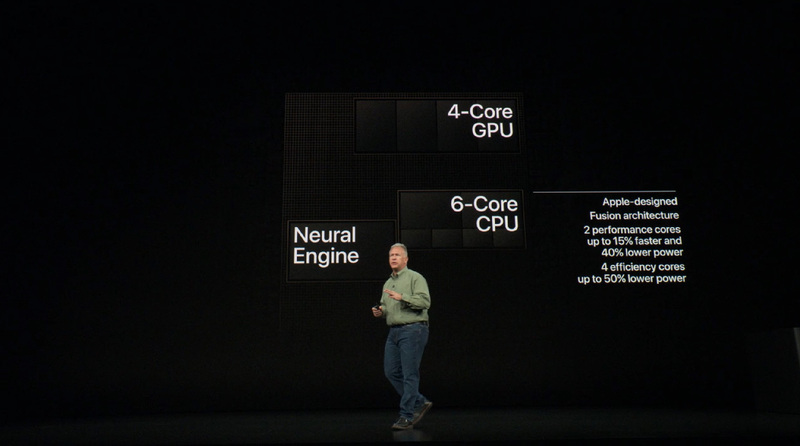 All told, Apple is touting it as being up to 50% faster than the A11’s GPU. 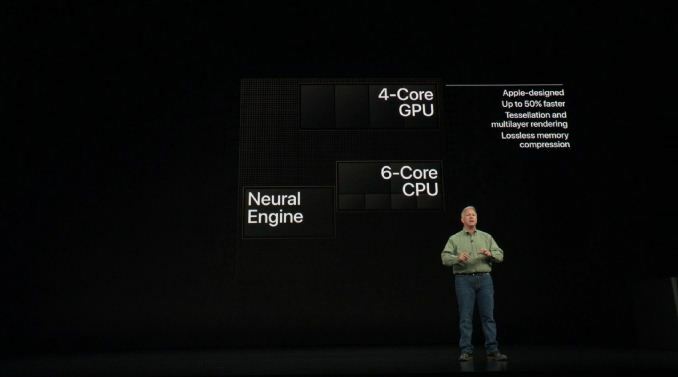 Beyond that however, Apple isn’t saying a lot about features beyond the fact that the latest GPU supports lossless memory compression and “tessellation and multilayer rendering”. 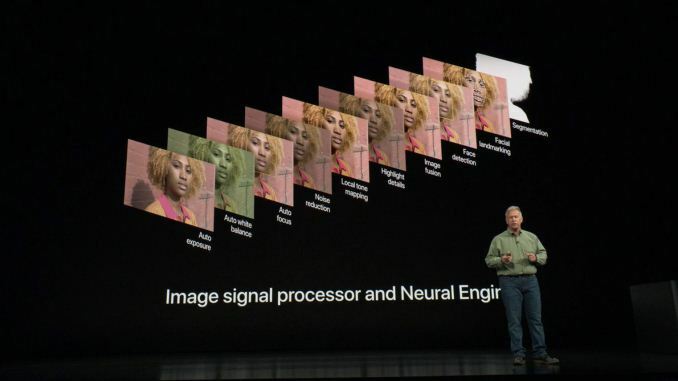 Apple has been increasingly customizing its GPU designs, to the point where it’s not publicly clear where Imagination’s tech ended and Apple’s began. So the company has been keeping a tight lid on features. At a high level, none of these features is ground-breaking, and actually the memory compression is something that been ubiquitous for other mobile GPU architectures, so it's surprising to see Apple essentially admitting they didn't have it before the A12. 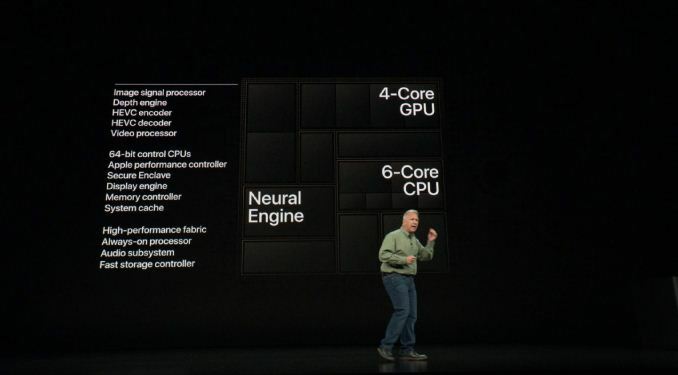 The third part of the processor triumvirate – and likely where the bulk of Apple’s transistor budget has gone – is the neural engine, Apple’s name for their block responsible for processing (inferencing) neural networks for AI. Relative to the A11, Apple is promoting some huge increases in both the basic block size and in the resulting performance. The latest neural engine is described as an 8-core design, up from 2 cores for the A11. In turn, peak performance has jumped from 600 GigaOPS to 5 TeraOPS, an increase of over 8x. Given the core count, I have no doubt that part of this outright comes down to Apple laying down a lot more silicon for the task. Which goes to show just how important Apple considers the neural engine and the workloads that run on it towards current and future iPhone applications. However the latest version of the neural engine also adds what Apple calls “multiprecision” support, better known as variable precision. Smaller data formats lose precision, but they can be processed more efficiently. So Apple’s 5 TOPS claim is almost certainly based on this, which is an important distinction because not all workloads can be run at a lower precision. So the real-world performance difference may not be as great as it looks on paper. 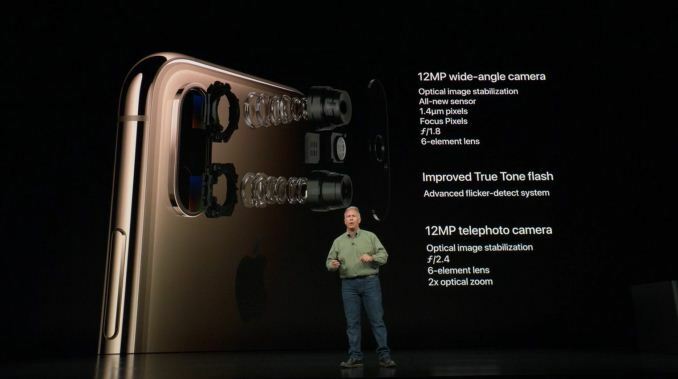 Both the iPhone XS and iPhone XS Max also get Apple’s latest camera system. 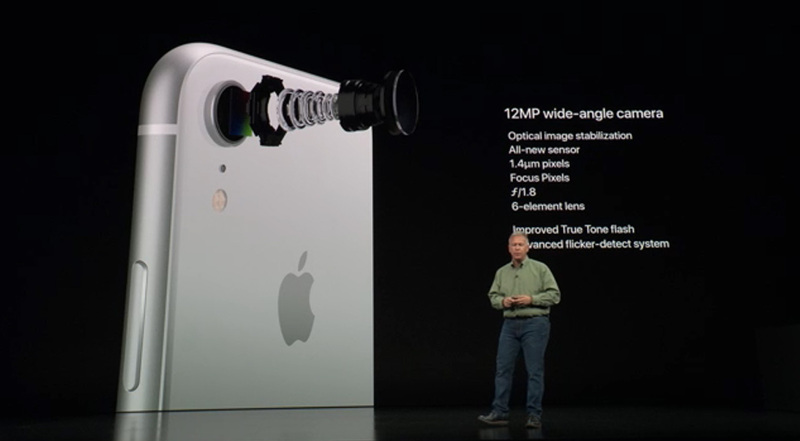 Of all of the features presented today, I feel like it’s the camera where Apple has put the most of their marketing focus, especially as they look to put that neural engine to good use. At a high level, the specifications for the XS’s camera has not changed much from the X; we’re still looking at 12MP sensors for each the standard (wide-angle) and telephoto lenses, with an f/1.8 and f/2.4 aperture respectively. Furthermore both cameras feature OIS, and wide color capture support. From a feature standpoint then, Apple’s marquee camera feature for the iPhone XS is what they are calling Smart HDR, which is meant to take advantage of the new sensor along with the vastly improved neural engine and other ISP improvements to improve the quality and dynamic range of their HDR photos. This is accomplished by taking more photos in general (or perhaps more accurately, samples), combined with further image processing. And while not pointing your camera at the sun is still good advice, it definitely makes for a flashy demonstration to have a camera that can handle the large dynamic range that comes from shooting against the sun. The other big feature addition here is that Apple is further ramping up its bokeh post-processing capabilities, which they call Depth Control. The latest iteration of this feature allows for fine-tuned depth of field adjustments to a photo after it has been taken. Rounding out the camera package, the front sensor suite for Face ID is similarly upgraded. The TrueDepth camera has the same optics as on the iPhone X, but it’s also picked up support for Depth Control and Smart HDR thanks to an updated sensor. 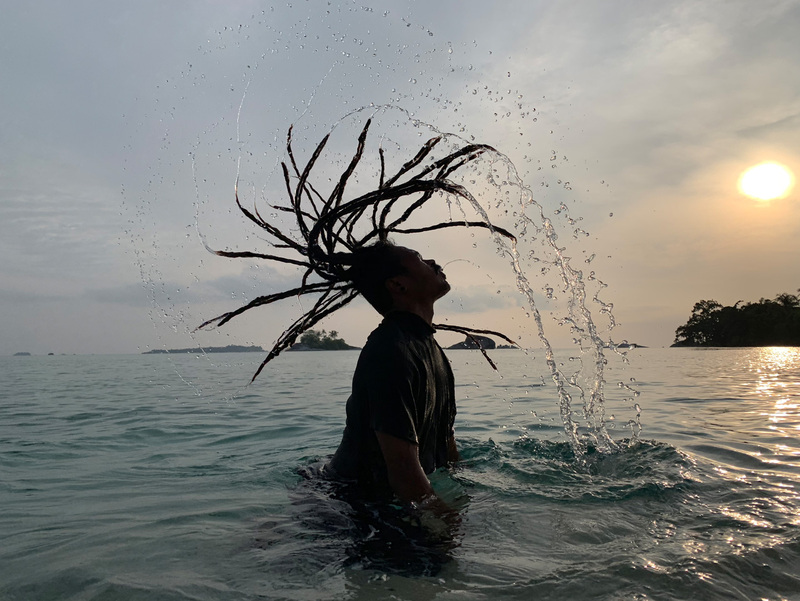 Apple’s specifications also list “cinematic” video stabilization, which strongly suggests that they’ve added Electronic Image Stabilization (EIS) for that camera. Finally, the sensor suite is being paired with a newer secure enclave, which Apple says offers much faster Face ID unlocking times. Moving on, with this being a cell phone, Apple has updated the cellular capabilities of their phones as well. While they aren’t publicly stating the modem used here – and I’m going to be very surprised if it’s anything but an Intel modem – they are talking a bit about performance. Whatever modem Apple is using, it now supports Gigabit LTE (e.g. Cat 16), which was supported in all of the models used on the iPhone X last year, and was disabled on those modems that did support it. 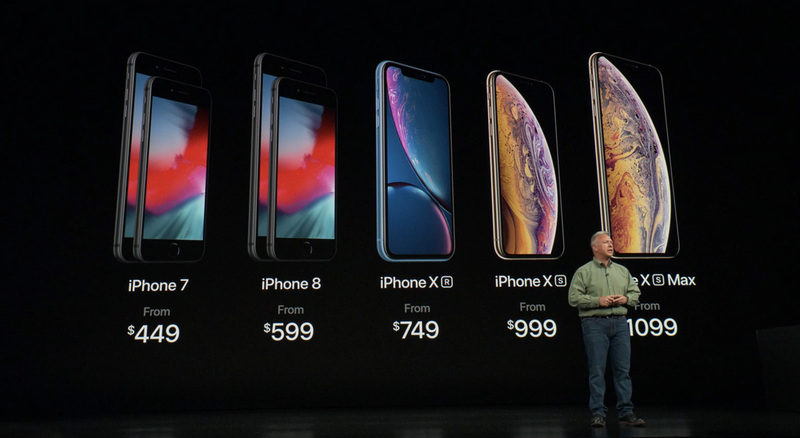 Note that there’s only a single model of each phone listed for the US, so it doesn’t appear that Apple is multi-sourcing modems this time around. The bigger news here is that Apple has added Dual SIM Dual Standby support to the iPhone, a highly requested feature for years. DSDS allows for a phone to be simultaneously connected to two networks, which means a phone can have two numbers, or a spare SIM slot for traveling, etc. For the US this will be in the form of an eSIM + nanoSIM configuration, making this the first iPhone model with eSIM support as well. eSIMs do away with the physical SIM card entirely, instead relying on pure software activation. Meanwhile in China where eSIM support isn’t a thing, the iPhone XS will just straight up use two nanoSIMs. And while Apple was working on altering the iPhone X’s body to support a second SIM, it looks like they’ve gone one-better in terms of sealing the phone as well. The iPhone XS (and XS Max) are IP68 rated, versus IP67 for the iPhone X. The difference is that the IP68 rating calls for an even higher level of water proofing: an IP68 phone should be able to withstand up to 2 meters of water for 30 minutes, versus 1 meter for IP67. In practice IP67 already brought with it most of the practical benefits of sealing a phone (e.g. 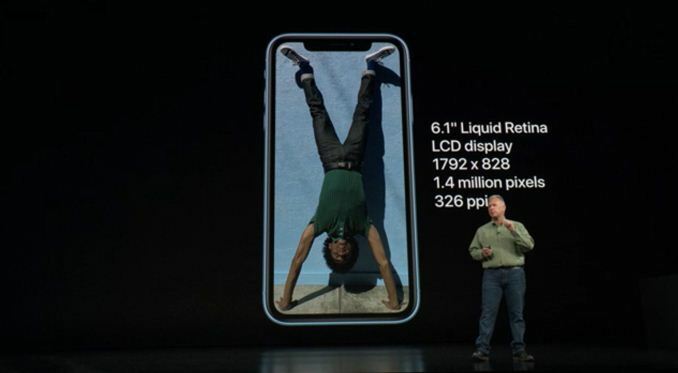 splash resistance), however if you do drop your iPhone in a pool, technically only the IP68 phone is going to be rated to withstand that (so long as you don’t go in the deep end). Finally, while Apple hasn’t detailed how they’ve achieved this mechanically, the iPhone XS family is being promoted as offering better stereo sound separation than the iPhone X. Whether this merely a speaker change, a software change, or a mix of both remains to be seen. Rounding out the 2018 iPhone family is the iPhone XR. Functionally a replacement for the iPhone 8 (Plus) in Apple’s product lineup, this phone is essentially a slightly pared down version of the iPhone XS, allowing Apple to offer it for a lower price. And as it is based on the iPhone X platform, rather than comparing it to the iPhone 8 and essentially reiterating all of the differences between the iPhone 8 and iPhone X platform, instead it’s easier to just compare it to the iPhone XS. In terms of size, Apple is only offering a single option here: a 6.1-inch phone. Apple essentially tried to split the difference here between the 8 and the 8 Plus here, and they ended up with something closer to the Plus, but still a bit smaller overall than the Plus. This means that the iPhone XR is Apple’s medium-sized phone, and that if you want something either smaller or bigger, you have to move up or down to an iPhone XS. The biggest change here from a features standpoint is the choice in display technologies. OLED displays aren’t cheap (especially to Apple’s standards), so the company has trimmed costs by utilizing a more traditional LCD. Dubbed the “liquid retina” display, this IPS display follows the iPhone X’s industrial design, notch and all. By the numbers it’s functionally closer to the iPhone 8 than the iPhone X, offering an 8-like pixel density of 326 PPI, resulting in a sub-HD 1792x828 pixel display. Since this is an iPhone X style phone, that means the LCD covers most of the body, so Apple seems quite pleased to have such a large LCD in a phone. In terms of features, the iPhone XR’s display offers the same P3 color gamut support as the 8, while relative to the X it’s not clear as to whether the phones cover an identical percentage of the gamut. Max brightness remains at 625 nits, while the contrast ratio, while not able to match the iPhone XS for obvious reasons, has been improved upon over the 8, now reaching 1400:1. Also, it’s worth noting that officially this model does not support HDR, unlike the iPhone XS. Interestingly, despite being an Apple staple for years, the new phone does not support 3D Touch (which is present in the 8 and XS). Instead Apple has replaced that with other gestures based around haptic feedback. Meanwhile the mechanisms for capturing light have been somewhat simplified as well. 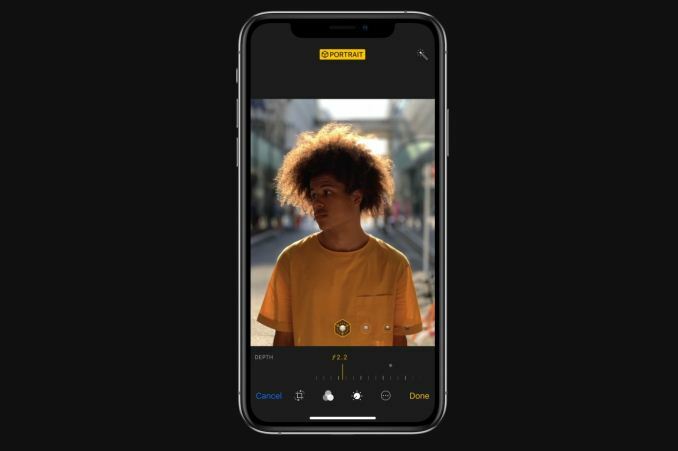 The iPhone XR gets the iPhone XS’s wide-angle camera system, complete with the updated sensor and features like Smart HDR and Depth Control. However in a move reminiscent of the base iPhone 8, the telephoto camera has been dropped; so the iPhone XR only has a single rear-facing camera. Despite that, at a high level the differences are supposed to be minimal. Apple says they can accomplish the same depth and HDR effects without a second camera, so we’ll see how well that works in practice. On paper, the only real loss is the 2x optical zoom from the telephoto camera. 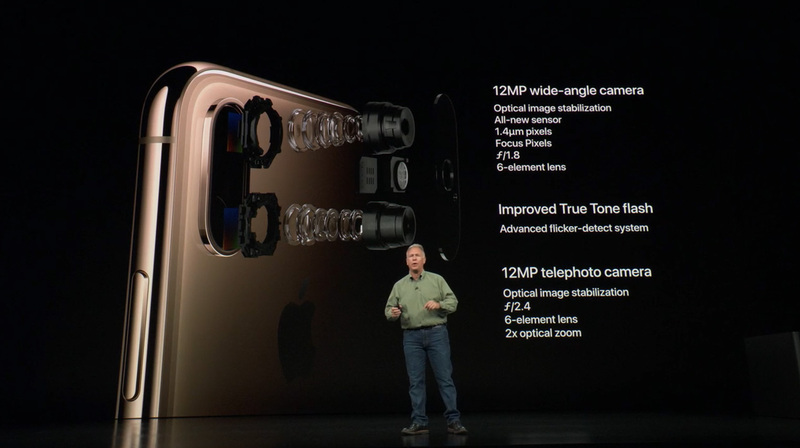 Past that, the front TrueDepth camera and senor suite appears to be identical to the iPhone XS. 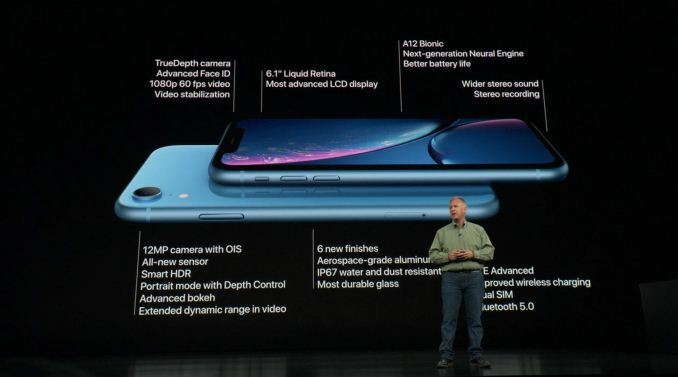 Meaning the iPhone XR uses the same 7MP camera system, along with the dot projector and other elements of the Face ID system. The final big difference between the phones, as one might expect, comes down to the body itself. Whereas the XS is glass and stainless steel, the iPhone XR instead mixes things up with aluminum and glass. Specifically, the back itself is still glass to allow wireless charging. Meanwhile the side band is aluminum, like some of Apple’s past phones. In practice I’m not sure this will make much of a difference from the iPhone XS, but I’m eager to see what Andrei finds in his hands-on time. Outside of these differences, based on what we know thus far the iPhone XR may as well be an iPhone XS. It has the same A12 SoC, the same industrial design, the same wireless charging capabilities, the same modem with identical DSDS capabilities, etc. I get the distinct impression that Apple wanted to bring their costs down without sacrificing too many of the iPhone XS’s major features, and they seem to have accomplished this. However with a $1000 phone being the new point of reference, it means that even this “cheap” iPhone is still starting at $750. Wrapping things up, as always Apple is going to offer all three phones in a variety of colors and storage capacities. The iPhone XS and XS Max will be offered with 64GB, 256GB, or 512GB of storage. And all three will be in Space Grey, Gold, or Silver. Meanwhile the iPhone XR will be offered at 64GB, 128GB, or 256GB. And with 6 different colors, all of which are more intense than the iPhone XS counterpart and none of which are Space Grey, Gold, or Silver. All told then, pricing is as follows. 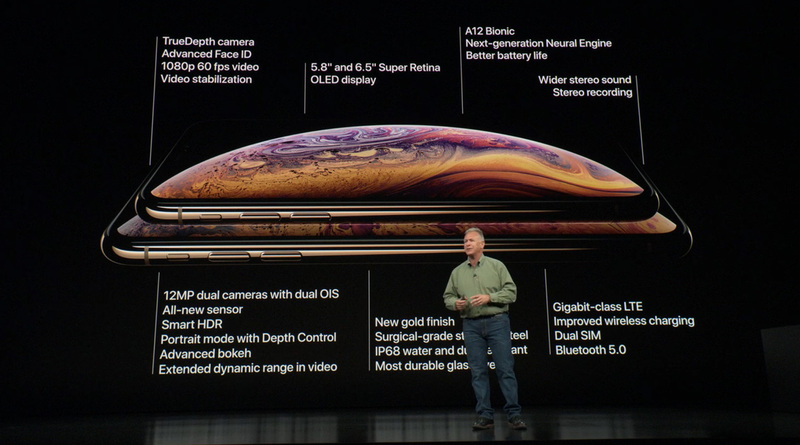 The iPhone XS starts at $999 for the 64GB version, jumping to $1149 and $1349 for 256GB and 512GB respectively. 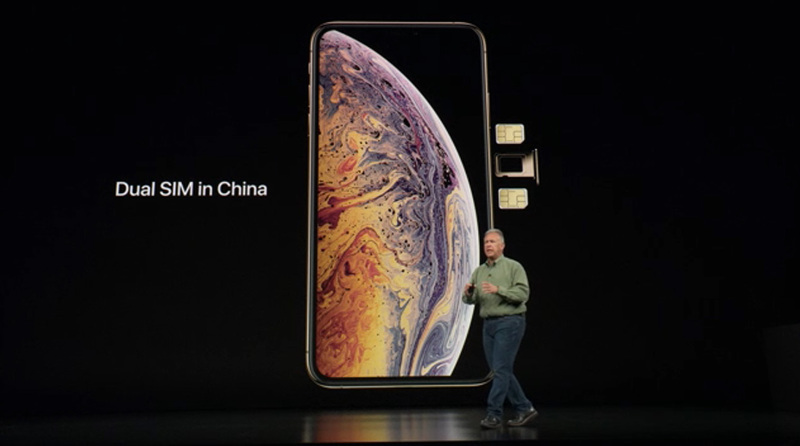 Meanwhile the iPhone XS Max carries a $100 premium for its size, pushing the prices for the same capacities to $1099, $1249, and $1449 respectively. Finally, the iPhone XR will start at $749 for 64GB, followed by $800 for 128GB, and $900 for 256GB. As for availability, Apple will once again be undertaking a two-tiered rollout here. Pre-orders for the iPhone XS will start this Friday the 14th, with availability a week after that on the 21st. Meanwhile pre-orders for the iPhone XR will not start until October 19th, and the phones shipping on the 26th. "The Apple iphone maximum excess"
Nope. Apple, maybe flagship in general, prices are out of crontrol. It's never been cheaper to get a delightful phone, ie a perfectly price-controled $150 Xiaomi redmi Note 5. People can choose to spend more, but reasons to do so, especially objective reasons, are very few. Flagship chip = iPhone 7 performance roughly. got me a remi 5 plus "global" around 2.5 months ago and besides a few "quirks" is perfect in pretty much every way. I wish could easily swap the battery because they eventually die, but phone, charger, screen protector and case all told $356 (tax and ship) is pretty decent price, considering is that much better then the previous phone I had Moto G4 Play which ended up costing me roughly the same price overall. I seriously do not get Apple (or Ngreedia) want to charge big bucks for things that are at most "slightly" better then previous versions, but end up being worse in many ways, mostly in the cost department...in Apple case, they build them in such a way to make sure you cannot easily repair or replace anything on them, and these days, require service places to "destroy" instead of "repair"
Exactly. This is the age of the lavish smartphone, the uber premium. These are not really intended for everyone. The market isn't there anymore, not the one that feels the need for the upgrade. Came in here just for the 120hz.. Not the display itself? Oh well. I’d be careful with Apple Refurbs. You know the iPhones that had problems with “Touch sickness” and the no service issue on iPhone 7?